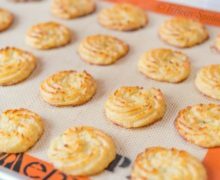 Also known as Duchess Potatoes, these potato bites are made with whipped mashed potatoes that are baked in the oven until crispy on the edges, and smooth in the middle. I have always been a huge fan of having leftovers (I get to eat delicious food again and no cooking is required?! ), but I know some people dread them. I think the key for those people is to turn leftovers into something new. We have a lot of leftover mashed potatoes after holidays like Thanksgiving, and I intentionally save some to make these Crispy Mashed Potato Mounds. The best part about these crispy potato bites is the contrast between the creamy mashed potato in the middle and the crispy edges. They’re sort of like baked tater tots. There are two major ways to make these. 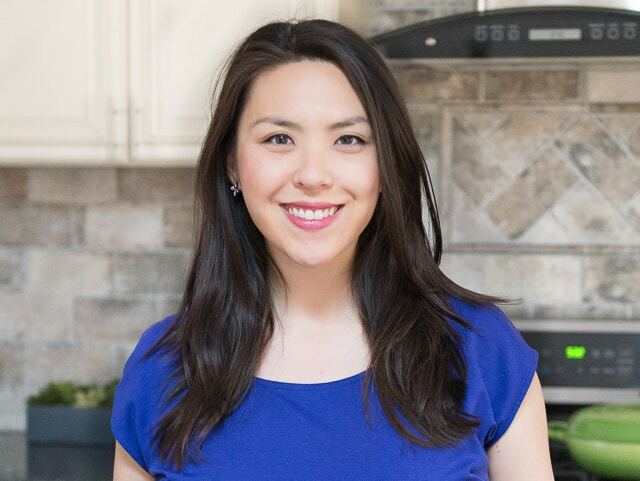 Preheat the oven to 450 degrees F, and line a baking sheet with parchment paper or a silpat. Method A: Place the mashed potatoes in a piping bag fitted with a large star tip. 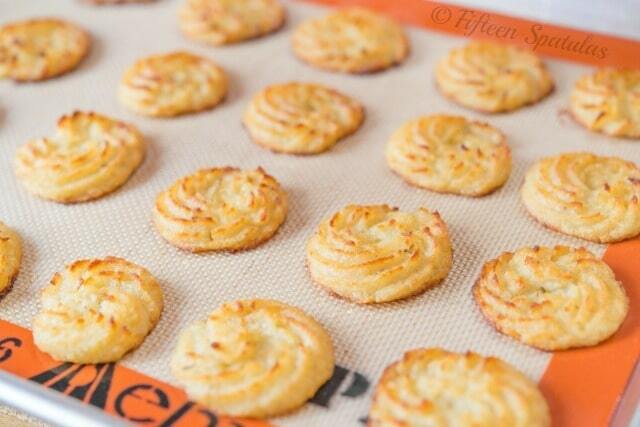 Pipe the potatoes into small mounds on your lined baking sheet. 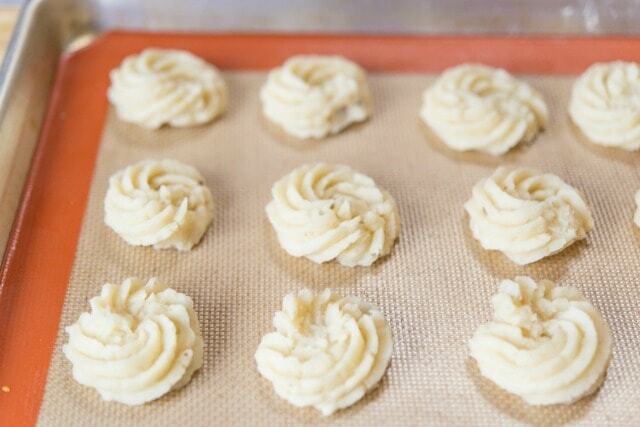 Method B: Use a cookie scoop or spoon to portion small mounds of mashed potatoes on your lined baking sheet. Use a fork to rake ridges into the mounds. 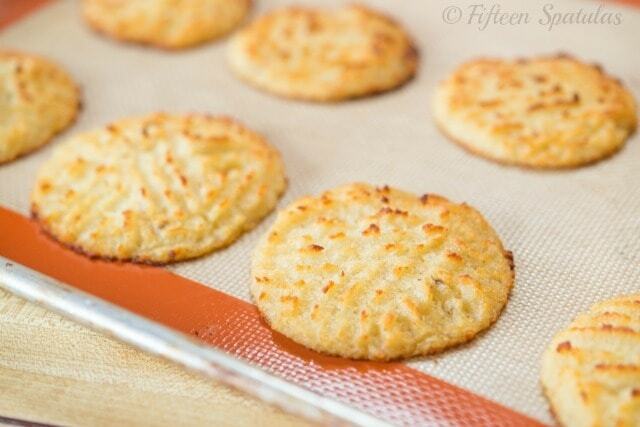 Bake the potato mounds for 20-30 minutes until the edges are golden brown. Enjoy while warm and crispy. If you need to make mashed potatoes: Peel and roughly chop the potatoes into large chunks. Place in a pot of heavily salted cold water and bring to a boil. Cook until fork tender, about 10 minutes. Drain and spread the chunks out onto a sheet pan, and mash with a fork until very smooth. Remove the leaves from the rosemary sprigs by running your fingers down the stem. Chop the rosemary up and place in a saucepan with the half and half. Bring to a simmer, then cover with a lid and let steep for 10 minutes. Strain the rosemary out of the half and half, and add it to the mashed potatoes along with the butter. Season with salt and pepper to taste, and the potatoes are ready to be used. Argh! I fried my leftover mash and I could have done this with it! Brilliantly done. 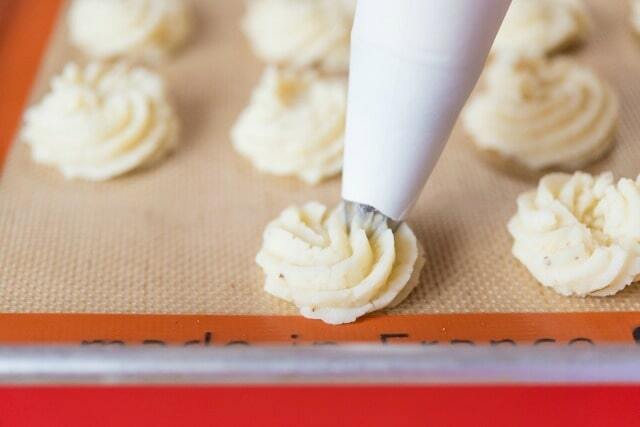 Totally doing this next time I have leftover mashed potatoes! I sometimes put corn in mashed potatoes….is it possible to use left overs for this? Hm, I can’t think of a reason why not! Hope it goes well. Ok, so I am all about freezing too. Can I freeze these?